If you're planning a trip to Disneyland Paris, you'll need at least one full day at Disneyland Park. But whether you're planning a vacation from the United States or just a short day-trip from somewhere nearby, fitting the best rides of Disneyland Paris into one day can seem challenging. We've got you covered. This one-day itinerary for Disneyland Park will guide you through getting the most out of a single day. If you're interested in our opinions on the major attractions, check out our Disneyland Paris Rides and Attractions post. And if you haven't already, check out our guide to Disneyland Fastpass in preparation for sorting out the details of your day. You also may want to check out our Disneyland Paris app guide and download the Disneyland Paris app, which will provide you with wait times while you're in the park. Note that some of these attractions might not be open, or some of the shows may have changed (particularly the 25th Anniversary and Halloween events), since we wrote this. Barring any unexpected, park-shaking changes, though, this guide should provide you a good outline. Finally, the rest of this post uses "Disneyland Paris" to refer to Disneyland Park, the castle park at Disneyland Paris resort (the other park is the smaller Walt Disney Studios Park). At the end of the post, we have a minute-by-minute recap of one of our most recent days at Disneyland Paris. It doesn't match this itinerary perfectly, which only serves to show how flexible you can be at Disneyland Paris. We're advocates of staying at a Disney resort, and we recommend Hotel Cheyenne. We also had a fine stay at Disney's Sequoia Lodge. But if you're not staying at a Disney resort (and thus can't access Extra Magic Hours) try to be at the park by 9AM. Despite a posted opening time of 10AM, it is sort of an open secret that Disneyland Park opens at 9:30. You'll follow the rest of the itinerary, trying to fit Peter Pan's Flight in later in the day. Disney hotel guests, plan to arrive at about 8:15AM to get the most out of your day. The park gates usually open around 8:00AM, and guests are given access to Main Street, U.S.A. until 8:30AM when the Extra Magic Hours rides open. As of September 2018, the Extra Magic Time rides are: Peter Pan's Flight, Pinocchio, Dumbo, Mad Hatter's Tea Cups, Le Carrousel de, Lancelot, Hyperspace Mountain, Buzz Lightyear, Orbitron. This list is (obviously) always subject to change. Arrive at 8:15AM in case anything opens early, or to take some good photos of the castle and Main Street, U.S.A. At rope drop, hop in line for Peter Pan's Flight as soon as possible. If anything else is open and you're confident you can get to the entrance to Frontierland by 9:30, consider riding it. In particular, target rides that don't have FastPass, like Orbitron and Dumbo. In our example itinerary at the bottom of the page, you'll see we completed five additional rides before 9:30AM. Hyperspace Mountain (or whatever the ride is renamed after the 25th Anniversary) will have FastPass availability well into the day, so you don't need to waste your morning time on it. Just make sure you're at the entrance to Frontierland by 9:30 (or even 9:20, to be a bit farther up). There are multiple routes to Frontierland when 9:30AM rolls around, but the Central Plaza entrance is closest to Big Thunder Mountain, so you'll want to use that entrance and head straight for Big Thunder Mountain. Depending on crowds and how fast of a walker you are, you should be done with Big Thunder Mountain by about 9:50 or 10AM. We really don't recommend grabbing a Big Thunder Mountain FastPass at this time. In our example itinerary below, we did this and it led to a series of issues. We wound up on Autopia around 9:40AM, which worked out okay, but the time probably would have been better spend on Big Thunder Mountain. After Big Thunder Mountain, you can head to Phantom Manor and then to Indiana Jones. If the Indiana Jones wait is over 10 to 15 minutes, skip it, you'll likely be able to get a Fastpass for it later in the day. Hopefully it's about 10:30 now, and you'll want to head to Discoveryland, where you'll grab a Fastpass for Star Tours and wait in line for Hyperspace Mountain (or vice versa). Your Fastpass should be quick enough that you can get on Star Tours with only a small gap. But wait! Before you use that FastPass, grab a FastPass for Buzz Lightyear Laser Blast. You can grab a new Fastpass once the window for your old one starts. Alternatively, feel free to mix up these three rides. This is especially a fine idea if the wait for Buzz is short (20 minutes or less). The Fastpass line for Buzz is actually quite awful and you'll wind up waiting 15 minutes to ride it even when you use your Fastpass, so it isn't a bad idea to plan for your second Fastpass to be something other than Buzz if you can wait in a short Buzz line early on. But you have to make sure you leave Discoveryland with two rides done and one Fastpass in-hand, because these FastPass tickets do run out later in the day. You could use a small gap between Star Tours and your Hyperspace Mountain Fastpass to see Nautilus. If the gap is bigger, check the Fantasyland wait times for rides like Pinnochio, Snow White, and "it's a small world." If Buzz has an acceptable wait time, that's a fine option, but don't count on that. You could also explore Alice's Curious Labyrinth or Sleeping Beauty Castle (including Sleeping Beauty Gallery and The Dragon's Lair). If you're sitting on a Disneyland Paris Fastpass for Buzz, plan to grab a new one before getting on Buzz. If you didn't ride Indiana Jones yet, go grab that one. It's a long walk, but it pretty much guarantees you'll fit the rest of your day in easily. If shows matters to you, which they should, don't forget to check the times. Try not to plan to make the last showtime of something, always try to make the first showtime. 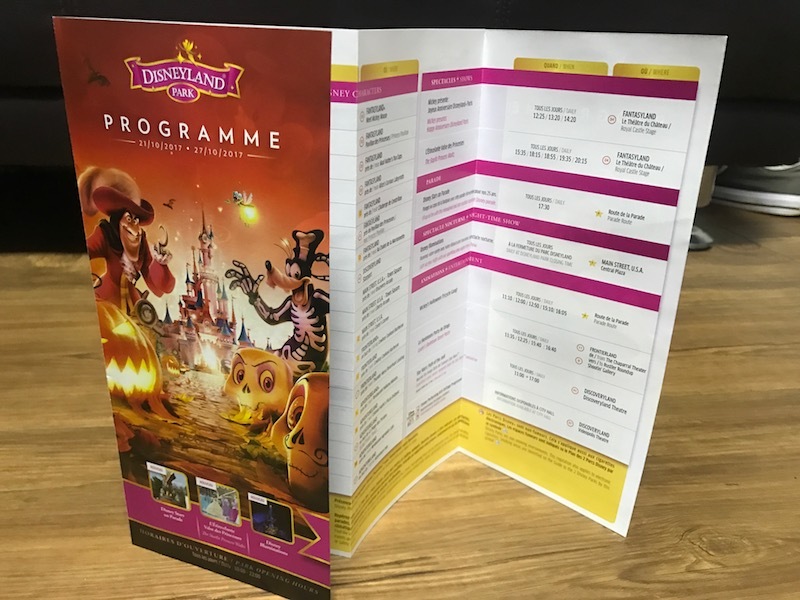 Check the Disneyland Paris app, but also be sure to grab a Programme at the front of the park. Be sure to grab a times guide ("Programme"), which lists some times you won't even find in the app! When you have longer gaps, plan to cross off Pinocchio, "it's a small world," and Snow White, which should have waits of 15 minutes to 45 minutes. For shorter gaps, or longer gaps where you don't want to wait in lines, cross items off the "things to explore" list. Bear in mind that the Robinson House and Alice's Curious Labyrinth can move slowly, so don't force those into 20 minute time slots. Again, check the Disneyland Paris app for wait times. The last thing you want is to run out of time or have a must-see ride break down before you get on it. It's rare, but it happens. A 45-minute wait in the middle of the day can be troublesome for picking showtimes, but it might make sense for you. Here's an example of how you apply the above four rules. While in Adventureland, visit the Robinson Treehouse and, if time permits, the Enchanted Passage of Aladdin. The street party is short, so at 4:45 head to Adventure Isle to explore. Grab a spot for the 5:30 Stars on Parade by 5:15. At 6PM, you'll have three or four hours left to cover one Fantasyland dark ride, Alice's Curious Labyrinth, and Pirates of the Caribbean. Unless you're pressed for time, we suggest adding in Le Pays des Contes de Fées, which closes at 6PM. Even if you have to push another Fantasyland ride until after 6PM, you're still left with plenty of time in your day. Pirates of the Caribbean is a great ride at night! Remember, Fantasyland closes early (one hour before park close when we were there), so don't wait too long for anything you have left there. Also, don't push Pirates of the Caribbean (or any ride) too late, lest you wind up stuck in line during the fireworks. Finally, a bit before park close, grab a spot on Main Street U.S.A. and watch Disney's Illuminations. Here's an example of how a day applying a variation of our itinerary went. We were at Disneyland Paris in September 2018 on a weekday with moderate/light crowds. The indicated time windows are from when we got in line for a ride until when we got off the ride. Comment: At this point we could have grabbed a FastPass for Hyperspace Mountain. We opted against it mostly to add some minimal challenge to this itinerary. Comment: While on our last trip Indiana Jones was running at this time, we now believe this is unusual and that you shouldn't count on anything other than Big Thunder Mountain to be running on this side of the park at this time. This is why we think riding Big Thunder Mountain will usually be the best decision here. 1:11PM - 1:19PM - Casey Jr.
2:03PM - 2:17PM - "it's a small world"
After this, we headed to Walt Disney Studios park, before returning after the parade (you obviously should feel free to stay for the parade) to finish the odds and ends (things like Swiss Family Robinson Treehouse, Adventure Isle). The only major attraction missing from this itinerary was Phantom Manor, which was closed during this trip. The carrousel was also closed. So by the end of this day, we had just under five hours left of park time (minus 30 minutes you'd commit to the parade) and only one major attraction left. Plus, we sort of botched our morning with that Big Thunder Mountain debacle. It's pretty obvious that even with longer waits and slower feet, you would have plenty of time to see all of Disneyland Paris in a single day. Do you have any questions about spending a day at Disneyland Paris?